Congratulations to the Central Coast Mariners, and more importantly to everyone who supports them following a belated first win of the season. You did it! What a relief. The Mariners 2-1 win over Melbourne City on Wednesday night was the first under new coach Mike Mulvey, the first with Matt Simon back at the club and their first win in the A-League since February 23 last year. In truth it had been a long time coming. The Mariners should have beaten Wellington Phoenix last weekend, and they’ve played well enough to genuinely trouble Perth Glory, Sydney FC – twice – and the Newcastle Jets this season. Doesn’t it feel good, denizens of Gosford? There’s been a bit of a fallacy floating around the A-League for a while now that fans of rival clubs don’t like the Mariners. I’d say that’s never been especially true – except if you’re a Jets fan – but that plenty of A-League watchers have grown tired of the once-mighty Mariners putting out teams on the cheap that function as little more than cannon fodder. If the Mariners win again at home on Sunday evening, they’ll move off the bottom of the table for the first time since Round 3. Which probably tells you how their next opponents Brisbane Roar are going. 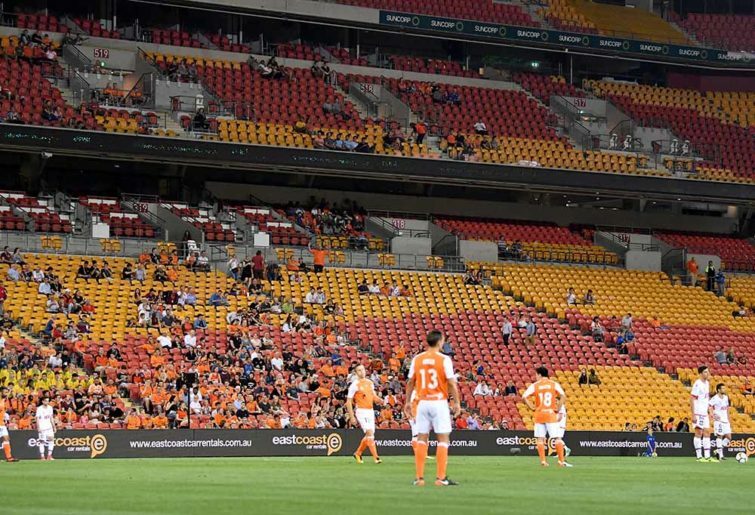 The Roar’s midweek mauling at the hands of Melbourne Victory made for grim viewing for local fans, which perhaps explains why only 7,131 of them turned up at Suncorp Stadium. In truth that was arguably more than anyone expected to be there. And the atmosphere was subdued, even if what’s left of The Den actually did turn up to provide some vocal support. Shortly before kick-off, Brisbane Roar released a statement saying they’d removed their support for the leadership of The Den. One of the group’s leaders, whom I’d had a “free exchange of ideas” with on Twitter the day before, pulled me aside for a friendly chat about what he thought had gone wrong in the build-up to the match. I appreciated the discussion and sympathised with his version of events, not least because I care more about what’s happening with the A-League’s supporter base than several other aspects of the game. But as much as I sympathised, I couldn’t shy away from the fact that a few home truths still need to be delivered to a certain section of the A-League’s fan base. Active support is football’s key point of difference and should be a major selling point of the A-League. But it works best when it’s focused on actually supporting a club, instead of being reflected inwardly on the arcane machinations of the supporter group itself. There’s nothing wrong with disagreeing or criticising – goodness knows I wouldn’t have a column without it. But it’s hard for other fans to empathise when many active support groups end up providing more headaches than benefits for their club. And when the whole thing stops being fun – as has been the case in Brisbane for a while now – then more casual supporters who aren’t as interested in who leads the chants and how long someone’s been a fan for start drifting away. There are many ways to support a football club, but surely having their best interests at heart is an important element? That doesn’t mean never speaking your mind if you think something is wrong, but perhaps it does mean simply taking your licks from time to time and coming back with a renewed perspective the following game. Too many of us have invested far too much time and effort in the A-League to simply turn our backs on the struggling competition now. I’d like to see Brisbane Roar’s active supporter base rebuild into the force it once was. But it has to actually back the club. Otherwise they might as well be away fans.